The American Metalcraft D406 sauce cup measures 45⁄8 inches long by 33⁄4 inches wide by 7⁄8 inches tall. It can accommodate 4 ounces of condiments, dips, or sauces. 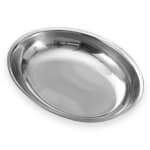 The stainless steel construction of the American Metalcraft D406 sauce cup is heavy duty and resists corrosion.